The oil industry vigorously opposed efforts to list the threatened dunes sagebrush lizard as an endangered species. 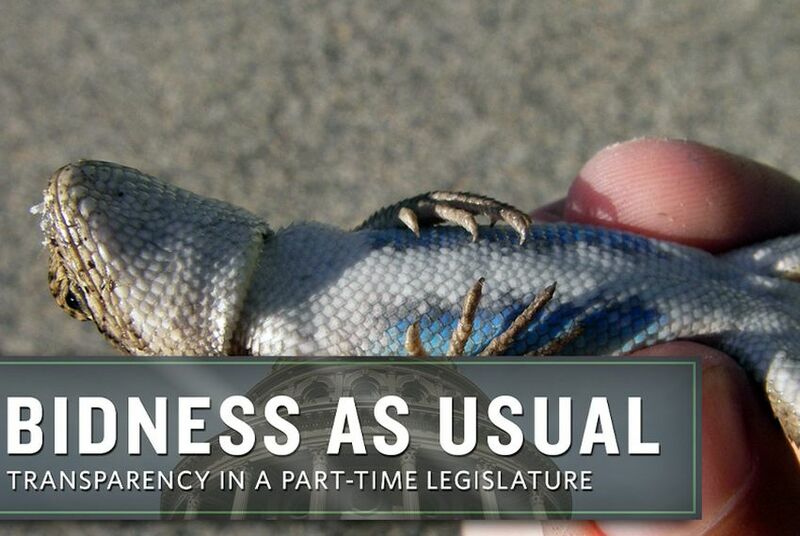 But three oil company lobbyists were given day-to-day oversight of the effort to save the reptile. When Texas promised to protect a threatened lizard in the oil-rich Permian Basin, state officials entrusted the day-to-day oversight to a nonprofit that sounds like an environmental group: the Texas Habitat Conservation Foundation. What’s not advertised is the occupation of the board members who created it. They are all registered lobbyists for the powerful Texas Oil and Gas Association, also known as TXOGA. The industry group's prominent role in the fate of the dunes sagebrush lizard has angered both environmentalists and influential GOP lawmakers who want to reform the way Texas oversees threatened and endangered species. The flap has also exacerbated traditional tensions between corporate oil interests and independent producers, and it has put Comptroller Susan Combs in the crosshairs of some fellow Republicans. The controversy has its origins in the special session of 2011, when then-state Rep. Warren Chisum, R-Pampa, slipped an amendment onto the innocuous-sounding “fiscal matters” bill that had to pass because it provided badly needed revenue for a cash-strapped Legislature. Chisum’s amendment, which he said was pushed by the oil and gas association, granted key state authority over the handling of endangered species matters to the office of the comptroller, a role that has traditionally been played by the Texas Parks and Wildlife Department, officials said. “There was a group of us, the people from TXOGA, and we said we need to get this done," Chisum told The Texas Tribune. "That’s how it got started. Of course, we brought the comptroller in." The U.S. Fish and Wildlife Service had already proposed listing the lizard as endangered by then, a move strongly opposed by TXOGA and others in the oil industry, along with virtually any Texas Republican near a microphone. In response, Combs, working with the oil industry, landowners, local government officials and others, proposed a voluntary program to protect the dunes sagebrush lizard. The idea was to forestall a declaration or “listing” of the lizard as an endangered species, which would come with environmental restrictions that opponents said would inflict serious economic damage on a region described as the nation’s top oil producer. Lacking wildlife expertise in the state’s chief tax agency, Combs then contracted with a division of Texas A&M University — the Texas AgriLife Extension Service — in November 2011. But A&M needed help on the ground, so it sent out a request for proposal for a contractor that could handle contacts with landowners and oil companies who would sign up for the voluntary program and undertake measures to save the lizard — like cutting down mesquite and removing old oil equipment. Officials say no one responded to the contracting request. TXOGA then went to Combs and floated a plan to have the oil and gas lobby group start up a nonprofit foundation to implement the Texas Conservation Plan in the lizard’s oil-rich habitat in the Permian Basin, according to TXOGA lobbyist and foundation board member Deb Hastings. “We did have a conversation with the comptroller’s office to see if it would be appropriate if we set up a foundation temporarily,” Hastings said. She said she did not recall that Combs raised any objections. The foundation was formed in February 2012 with three registered TXOGA lobbyists overseeing it as board members: Hastings, Robert Looney and Mari Ruckel. When asked if anyone ever thought putting oil lobbyists in charge of lizard protection in an area dependent on the industry might present a conflict of interest, Hastings said: “I could see where there was some perception risk regarding that, but there was nothing nefarious about this. It was above board. It was meant to ensure the species was not listed.” Hastings emphasized that the foundation hired a wildlife biologist to handle the scientific oversight and run the day-to-day operations. U.S. Fish and Wildlife withdrew its proposal to list the lizard last summer, but could reinstate it if voluntary efforts fail. Lesli Gray, spokeswoman for the federal agency, said the officials gathered in Midland this month with counterparts from Texas A&M and the comptroller's office. She also said the comptroller's office has been providing regular updates as required in its state-federal conservation agreement. "The comptroller is very pleased that the work done by all of the stakeholders involved in this process resulted in a plan that caused the U.S. Fish and Wildlife Service not to list the DSL," said Combs spokesman Lauren Willis. "We are proud of the role we played in that process and the work we did to save the West Texas oil and gas economy." But some powerful Republican lawmakers are voicing concerns about TXOGA's role and the comptroller's oversight of endangered species. Chief among them is Sen. Kel Seliger, R-Amarillo, whose district includes much of the Permian Basin and the lizard’s habitat. Seliger said independent oil companies are upset that TXOGA, which represents the interests of giants Exxon, Chevron and others, would be in charge of mitigation efforts for the whole industry — and potentially stacking the deck in favor of itself. "You might have competitors determining costs that other competitors would have to incur to drill oil wells," he said. More broadly, Seliger said there is no reason why the state comptroller should be in charge of coordinating the response to endangered species. He has a bill that would move that authority — which includes the right to hold the federal permit Combs now has at the comptroller’s office — to Texas Parks and Wildlife. An oversight board composed of several state agencies, including the comptroller’s office, is included in the latest version of the legislation, he said. Willis, the Combs spokeswoman, said the comptroller is leaving the matter to the Legislature, but Seliger said the pressure against the legislation has been intense. He said Combs, TXOGA and the major oil companies were all trying to kill it. “The comptroller and the majors are lobbying vigorously against it,” Seliger said. Rep. Dennis Bonnen, R-Angleton, who is carrying the legislation in the House, said oil industry opponents are trying to “threaten” members who dare support the effort to give oversight authority over endangered species listings to another agency. For its part, TXOGA is poised to step out of direct involvement by handing over its authority to other board members. But the current board got to select the new one, and it has already identified its incoming chairman: Chisum, who sponsored the TXOGA-backed bill giving Combs the authority to handle endangered species matters. Now an oil and gas lobbyist himself, Chisum tapped two others to join him — biochemist Glenna Kyle and Joe Maley of the Texas Agricultural Land Trust, TXOGA officials said. Chisum was asked to respond to complaints that oil company interests shouldn't be in charge of the foundation set up to enact the conservation plan. He said qualified biologists are hired to do the work, but noted oil companies were paying to participate in the voluntary plan. Chisum said they should have a say in how it's implemented. “It’s our money," he said.